“Swop and Sell”. Table Top Sale. Sulgrave Church Hall. Saturday 24th September. 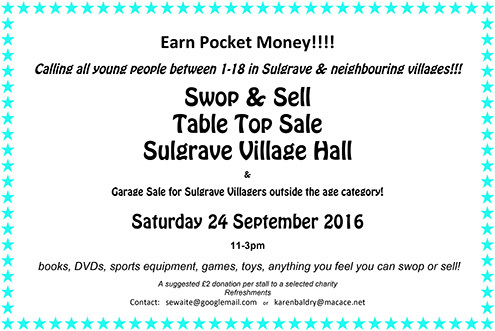 Susie & Karen are organising a Swap & Sell event for the younger members of Sulgrave village (& surrounding villages) to be held at the Village Hall on Saturday 24th September 2016. We are keen for anyone interested to contact us, so we are able to ascertain the numbers who would like to take part, and any teenage member of the village who would like to help organise the day with us. Please contact us on our email addresses below, to register your interest, and if you are able to assist, even if it is to pin up an A4 poster in places of public interest (schools/shops etc) to promote the day. We hope for a lot of visitors so stall holders do not have to return home with more items than they are trying to Swap & Sell! Essentially this is for the younger members to come together in the village hall, but there is also a garage sale for members of the village who are outside the official age category….! We look forward to hearing from you and the younger members of our lovely village! This entry was posted on Monday, June 20th, 2016 at 8:35 am	and is filed under News. You can follow any responses to this entry through the RSS 2.0 feed. You can leave a response, or trackback from your own site.